Allergy-Free Donuts in 5 Minutes! 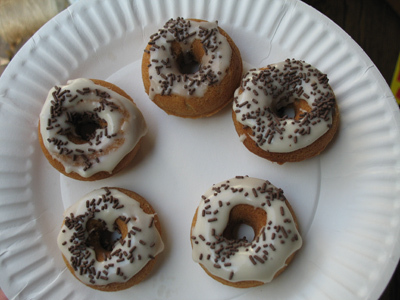 Check out these allergy-free donuts Sure Foods Living cranked out in 5 minutes. She used her new donut machine that she received for Christmas. Do you have one of those donut makers? Thanks for sharing this great recipe from Alison – what a treat – now I just have to work out how I can get the Cravings Pancake mixture in Australia! Maybe I will make up my own mix and have a go. You’re welcome! I’m hoping to find a safe pancake mix and use it in our regular donut pan. These look really good. I’m hoping to get a chance to try to convert my potato donuts to gluten free soon! Welcome Erin! You’re blog looks great. Can’t wait ’till you get your recipes up! I made these this mroning and they were a big hit. I used Namaste pancake and waffle mix instead of the one you used. I also had to add Rice Milk (vanilla flavor) until I got the right consistency. They were AMAZING! !